Lately I have been seeing lots of women dressing the same. The same as each other? No. Rather the same shade head to toe, ie. in a monochrome palette. The concept is nothing revolutionary, especially head to toe black in a city like New York. What does feel fresh and new is that the monochrome look of today is done through unique silhouettes and off-beat colors - ochre, forest green, muted red. While investing in a whole fuchsia ensemble may be extreme (though this girl above is crushing it), there are definitely ways to achieve a more basic monotone look from your own closet. You most like have a pair of navy or winter white pants in your wardrobe- try pairing them with a sweater in a similar shade. 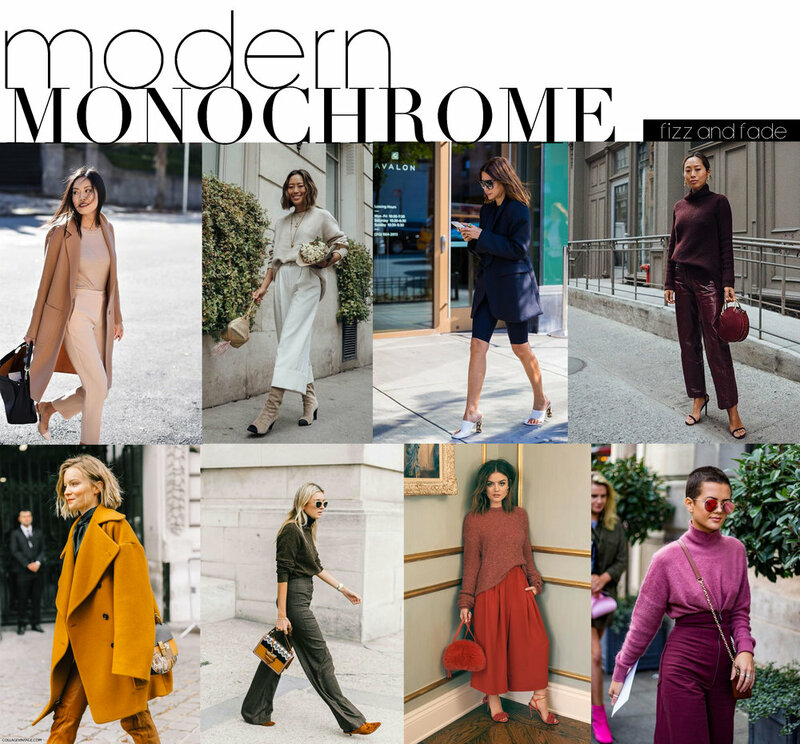 Pay attention to which colors suit you best and determine what one extra piece in that color palette could help you to create a monochrome look. Hit up your local H&M or Zara and be laser focused on that color, chances are you can find something affordable to round out the look. The best part about this styling is that it doesn't have to match perfectly, colors that are in the same family still convey the same monochrome effect. Now get out there and feel the rainbow!